I love challenges… Especially the kind that kick me into action and help to get big results in very little time. If you’re like me and you would like to boost your email list quickly, I’ve got just the little challenge for you. In this post, you’ll discover 5 things that you can do to get more subscribers. Each one can be done in less than 2 hours. Ready to grow that list? Here we go! I would like to receive another newsletter! 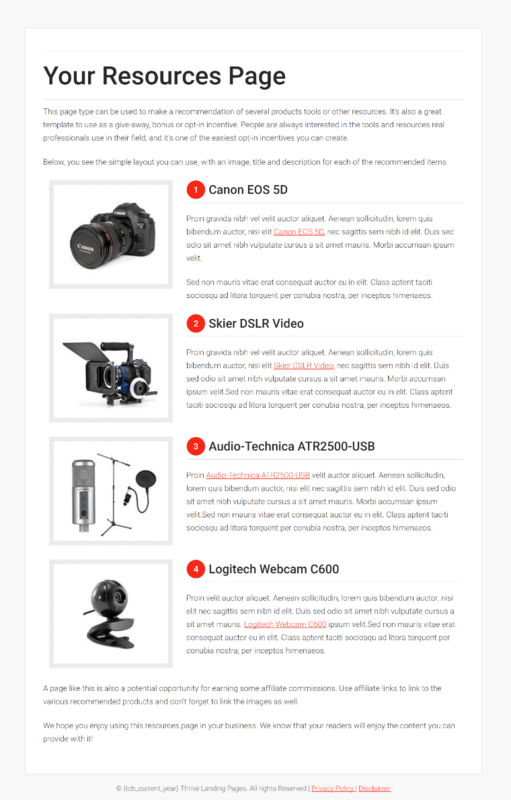 The famous phrase “Subscribe to Our Newsletter” is one of the 3 ﻿biggest conversion killers﻿ on any opt-in form and should be banned from the internet. That’s why you need an opt-in offer; a valuable piece of information to give to your audience in exchange for their email address. This could be many different things, an eBook, a video, a mini-course, a checklist, ... as long as it is appealing to your readers. You already have an opt-in offer? Great! Let’s make another one. More opt-in offers = more list building opportunities. Maybe your reader isn’t interested in eBook A but would love to see Checklist B. Different offers will resonate with different people. And unless your name is Nostradamus, it's impossible to guess which offer will be a home run. That’s why, when we started optimizing the opt-in forms on Eofire, the first thing we did was test 5 different opt-in offers against each other. Guess what, the opt-in offer that was promoted site wide was NOT the winner and this little experiment lifted conversions by 50.13%. A good opt-in offer is a quick piece of information that answers a specific question your audience is having. That's why a list of tools or resources makes for a good opt-in offer. 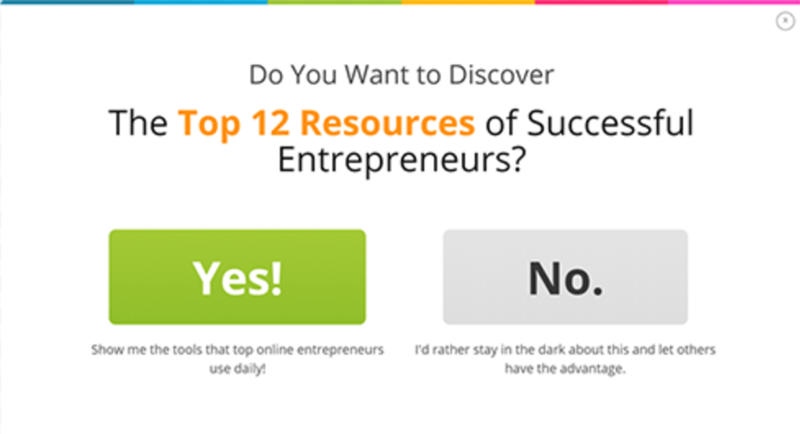 Because we want to test this (new) opt-in offer quickly, I suggest you make a resource page. This is a page that's hosted on your website. After subscribing, your reader gets access to this page. Create a new page on your site and choose the “review resource” landing page from the Thrive Landing Page library. You now have a page that looks exactly is the image below. Customize the images and the text. Create a new opt-in form in Thrive Leads, as the after sign-up action select “redirect to URL” and paste the URL of the page you just created. Use a plugin like Yoast SEO to set the index settings of the page to "Nofollow" and "No index" this will avoid people finding this page through Google. Publish the page. Your new opt-in offer is live! We recently ran a test on the Thrive Themes website for our primary opt-in form (the one that is shown to new visitors on all of our blog posts). We tested a multiple-choice lightbox against a multiple-choice screen filler with a completely different design. Both are offering the same opt-in offers with the same copy and display immediately on page load. +80,2% in conversion rate for the screen filler… That’s a lot of extra subscribers for very little effort! And you can do the same. In your Thrive Leads dashboard, go to the lead group of your primary opt-in form. Add a different type of opt-in form. I suggest you pick an opt-in form type that is more interruptive than the one you have now. Start the test, sit back and relax. What do you do if someone wants to come visit you? You give them your address. And not just the street you live in, but also the exact house number so that they can put it in their GPS and arrive quickly without detour. A landing page is the home of your opt-in offer, it allows you to give a direct address to interested people. If you already have a landing page, let’s make a new version to test. Click here if you need full (video) instructions about how to set up a list building funnel. 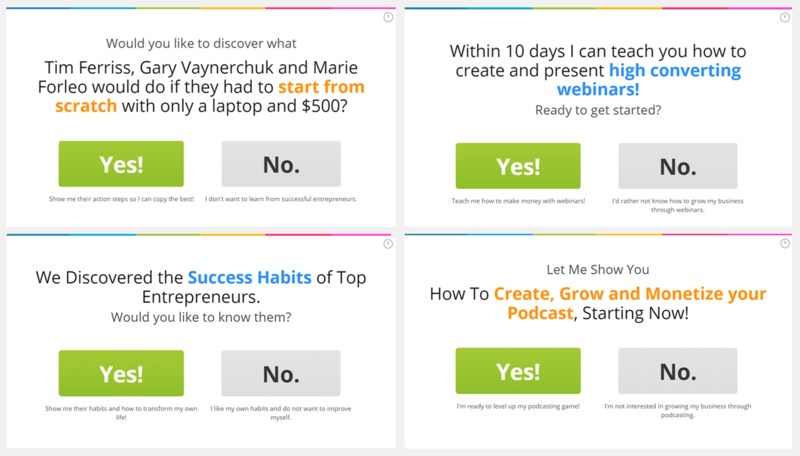 Set up an A/B test if you already had a landing page for that opt-in offer. Drive traffic to your landing page. You can find 10 traffic generation ideas here. A content upgrade is an opt-in offer that is specific to one piece of content on your site. Because the offer is so closely related to the blog article, signup rates are typically much higher than for a more general opt-in offer. You can see an example in the blog post 6 Mental Shortcuts That Make Your (Customer’s) Brain Say BUY. The content upgrade is a summary of the 6 psychological triggers + 2 extra brain hacks. Content upgrades work, but it also takes time to create them. That’s why I suggest you find your best content (the content that gets a lot of traffic) and create a content upgrade for that blog article. Find the article that gets the most traffic. If you’re using Thrive Leads and you have an opt-in offer that shows on all of your blog articles, you can use the content marketing report and sort by impressions. The article with the most opt-in form impressions is the one that gets the most traffic. Or you can use Google Analytics to find the article that gets most visits. 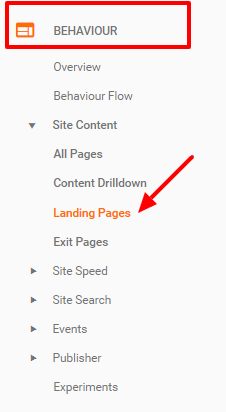 Go to "Behaviour" and click on "Landing Pages". Next, use one of the content upgrade templates and the asset delivery feature in Thrive Leads to set it all up on your blog article. Quizzes are fun to take and you can use an opt-in gate to turn your quiz into a list building machine. 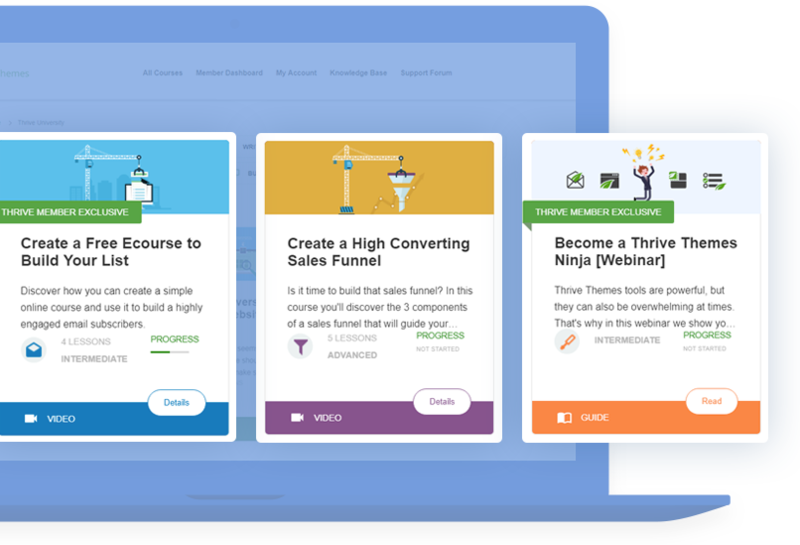 There’s only one rule to keep in mind if you want your quiz to be successful at generating leads: the offer you’re making has to be valuable enough so that people want to give their email! This means that the quiz taker needs to be curious enough to see the result to actually give their email. You can find examples of how marketing pro’s are doing it here. Use the dynamic content on the opt-in gate to personalize the page and/or to segment your email list based on the results of the quiz taker. Use the dynamic content on the results page to show each quiz taker their personal result. Need more help? Sign up for the free Thrive University Course: How to Use Quizzes to Boost Conversions. What strategy will you implement this weekend? Let me know in the comments below! Isn’t the weekend for relaxing and recharging? We Entrepreneurs work so much.. Don’t guilt shame us on working on our business on the weekend.. :) going to a festival now..
Great article on ways to quickly create an opt-in offer and build the list…as we know money is in the list :) I will try and get one of them up this weekend. I’m working right now on a strategy to try do increase my list, but I want to find out a way to have more responsive leads. Email is going down to 2 to 5% Click Rate. Really, really terrible. Most of my audience is using mobile devices and I believe that’s the future, just as Gary Vee says. Any plans or ideas to capture more leads and engage people on mobile ? I trust you guys with the solutions you offer, I don’t care if I need to pay for new tools, and I’m willing to pay to get the job done. 2. Mobile traffic is up. Are the emails you’re sending mobile responsive? Have you read one of your own emails on mobile? Maybe you have a big logo at the top that pushes the link down so that people don’t see it. Maybe the text is too small. Maybe the image or button isn’t showing etc. Make sure to check your emails on mobile and in doubt, use text emails without any fancy stuff (no images or logos or…) this way it will load fast, even on mobile network. 3. To capture leads on mobile, for now, you can already use a specific opt-in form on mobile. So you could use a screen filler or lightbox on desktop and not show those on mobile and then use a 2-Step ribbon on mobile so that this is a good experience for your user. I must do this on the next days! Thanks for giving a step-by-step action plan for what needs to be done and how to be done. Could you please tell me how to have this page secret? I mean anyone can access the link of that resource page via the sitemap or by going through the pages and other several methods (especially if your audience is on the same blogging niche (smart-guys everywhere)). We have tons of these pages and they are never “secret” (apart from the noindex I talk about in the article). The reason is that this would add an unnecessary layer of complexity. Like I explained, more opt-in offers mean more subscribers, so you want to be able to make these offers quickly and make a lot of them. Trying to protect the pages would only slow down this process without any real benefit. Great ideas. I’m going to try the A/B test with a screen filler up against my current pop up. We’ll see…! Let us know how it goes Cindy! We’re always interested in seeing results. Thank you Hanne. I’m working this weekend. I want to reach my goals quicker and faster. I executed your last idea I read of yours about the photo on the home page. Great content!! The link to 10 traffic generating ideas appears to be incorrect. It’s taking me to a page about creating landing pages instead. Amazing as always Hanne! I love the Thrive Team, thanks! We are really interested in creating the quizzes, I think the amount of important info you can pull can help no end. Hanne – Love your articles. I have them all snoozed in my inbox to read at some point. Would be a great idea to have a PDF version somewhere to download them and read them on the go. Hi Hector, thanks for the suggestion :) I’m afraid those PDF’s would then just stay on your hard drive though :) But I’m glad you like the articles and come back whenever you have some spare time! Also, that way you’re sure to have the latest information! Really Great Article – Upgrading your old content is really good way to keep the rankings moving!